This is one of the most revealing graphs we have posted. This Great Graphic comes from the Washington Post's Wonk blog. First, it shows that a step toward fiscal adjustment is coming to the US. 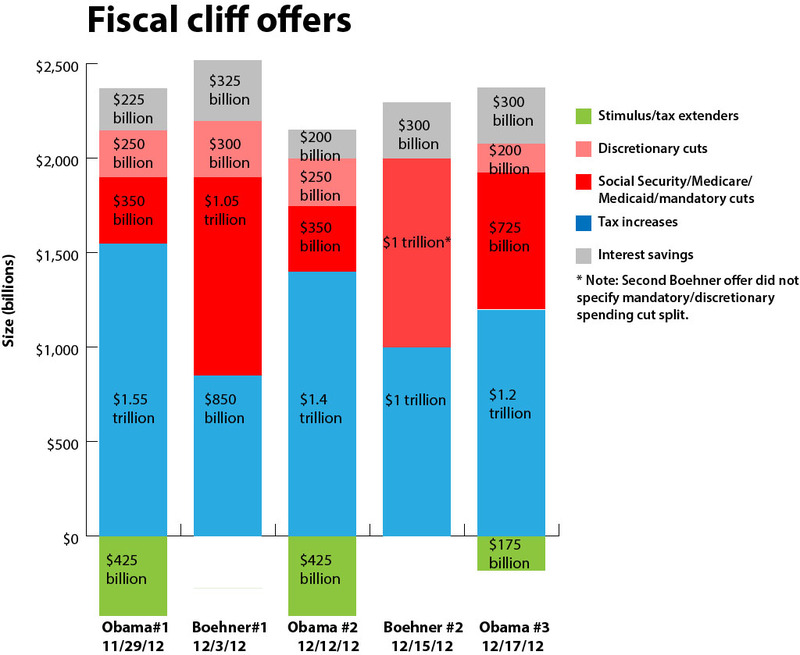 The difference between Obama's plan and Boehner's is how the burden of the adjustment should be distributed. Second, the chest thumping and the hand wringing that has surround the negotiations seems dramatically out of proportion with the differences. This is a case of the hubris of small differences. Third, the main difference, in terms of broad categories is that Obama seeks to extend some of the stimulus and is paying for it through discretionary spending cuts. 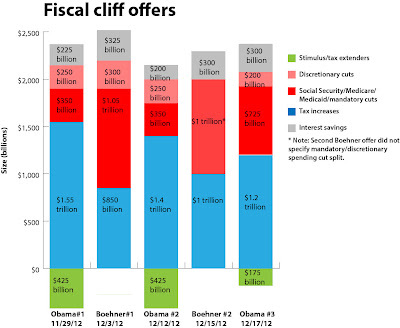 Obama has a bit more in tax increases ($1.2 trillion instead of $1 trillion) and a little less in Social Security/Medicare/Medicad mandatory cuts ($750 blns vs $1 trillion). Fourth, claims that Obama is a socialist while the Republicans are defenders of the free market and liberty cannot be supported by these differences. Contrary to the heated political rhetoric, most of the economic debate between the Democrats and Republicans would take place within the Tory Party in the UK. This is just another way to say that the US political spectrum is relatively small and is located in the right of European politics. Fifth, and related, the graph bears out a point that Obama made recently to a Hispanic audience. In response to a reporters question that some accuse him of being a socialist, Obama noted that his policies would have made him a moderate Republican in the 1980s. The point here is not just that the American political discourse is on the right, but that the entire spectrum has shifted to the right, contrary to conventional wisdom. Consider that in the early 1970s, Republican President Nixon imposed price and wage controls. That Obama could be to the right of Nixon in terms of economic policy is indeed thought provoking.